BBC Folk Award winners (Best Duo) Phillip Henry and Hannah Martin are described by The Guardian as being "Subtle, bravely original...a combination of virtuosity, intensity and charisma"
Unhindered by the limits of technical ability, they take self-penned material along with music rooted in the British Isles, and with the flick of a bow, a finely chosen chord or slip of a beat, produce richly atmospheric arrangements layered within a wealth of subliminal musical influences “with notes seemingly plucked from the stars and rhythms from the equator”. 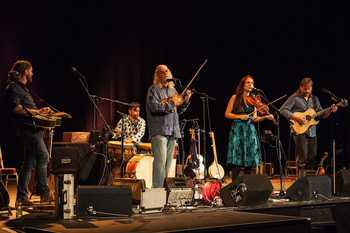 Phil and Hannah were initially invited to guest on two shows on Gigspanner’s Layers of Ages launch tour in June 2015, but an immediate offer for the five piece line-up to Headline at the following year’s Bristol Folk Festival was the first indication that collaboration, albeit an occasional one, might have a future. What a fabulous team they make, together producing a startlingly new musical form with few, if any, true antecedents. The flights of musical and interpretive fancy are staggering in their natural invention. "The Gigspanner Big Band are a unique musical proposition; they are taking folk music down new and enthralling paths. They are also one of the most exciting live bands you are likely to see this year (or any year, for that matter)"
"It takes a very special inner peace to have the confidence to do what these five do...no egos, no pretensions, no nonsense - it is music from the heart presented by five top class performers for the sheer pleasure of it"
"When I was nine or ten years old, my mum took me to see Steeleye Span at Sidmouth Folk Week. I remember it so clearly - I was absolutely mesmerized by Peter's violin and Maddy's voice. It was a hugely formative experience for me; I got my first book of folk tunes, sat on Sidmouth beach, and started learning to play them. I simply could not have imagined then that I'd be writing this now - to announce the album we have made with Peter Knight and his wonderful band! Listening to the final mixes felt amazing; and emotional - I wanted to jump around and tell my nine year old self to keep practicing”!